Inflation is an exciting topic for me. It highlights the #1 reason why people should be investing their hard-earned money in stocks. Well, pretty much anywhere but a checking account or a savings account right now. Inflation is the rate at which the general level of prices for goods and services is rising, and, subsequently, purchasing power is falling. The more money in the hands of people means there are more purchasers, in other words, demand is more and more…BUT the supply is less and production is less. So inflation takes place. Prices rise because everyone has the money and they are ready to pay more, and those who don’t have the money suffer (ie – your savings account!). I never used to worry about this until a few years ago when I realized I had accumulated my first $10,000. It was sitting inside a checking account. I knew the chances of needing to USE that money in the next 5-10 years were slim since I already had a steady job and I was continually saving money, so I started talking with some friends about investing, learning about online broker accounts, etc., and that’s when I first got started. Specifically when Visa had their IPO in 2008. 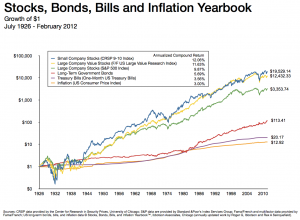 The reality of inflation didn’t really hit me until I saw a chart on inflation vs. investing. (See below again, or refer to my previous blog post on the topic here.) The only reason I bring this up is to help others get started with investing on their own, because if you’re not investing, you’re losing money to inflation, and that can never be a good thing. Thankfully, the central bank (the Federal Reserve) helps to stop severe cases of inflation, and they will usually try to maintain 2-3% inflation increases per year through using what’s known as ‘inflation targeting’. The Federal Reserve will do this through using monetary or fiscal policies. Bank rate policy is an example of a monetary policy, which happens when interest rates for loans to commercial banks increases. So,,, when inflation starts to get out of control (typically after the government prints a lot of extra money, which is what just happened in the USA and what just now recently happened in Japan), the central banks will increase the borrowing rate for loans to commercial banks. This is known as a ‘dear money policy,’ where ‘dear’ means not easy to get, or costly. The commercial banks are then suddenly less likely to give loans to people, reducing the flow of money to the public. If it’s harder to get money because of the banks, people aren’t going to buy as much stuff, and the demand will go down, driving prices down, helping to reduce inflation. This is great! But it isn’t happening…. yet. Instead, recently, rates have dropped so low that it’s becoming really attractive to get loans from banks (house loans, for example). And these rates are low on purpose; The government wants people to borrow more money to stimulate the economy. In fact, in September 2012, the Federal Reserve stated that these rates will likely remain low until mid-2015. And when the central bank injects $85 billion dollars per month into the economy, the money will of course eventually reach the people, who will then use it to borrow more money, etc. The point I’m getting at is that WHILE it’s much easier and more attractive to borrow money right now (inflation), it’s very difficult to grow your savings with a bank since the APY (annual percent yield) rates for savings accounts and CDs (certificates of deposits) have dropped so dramatically over the past 5 years (from 6% to 0.5%), which parallel the low rates for Treasury securities. The government doesn’t want you to save money when inflation occurs, they want you to spend it! Well, let’s fight this inflation together and let’s invest our money wisely with 4 things: A Roth IRA, Gold, Dividend Stocks and Real Estate. Before I get into these 4 separate categories, let me provide a quick summary of my thoughts on how to (in general) invest your money right now. My answer is always to diversify your money across multiple areas using dollar cost averaging. In other words, I would suggest not just looking into stocks, but also looking into gold, index funds, CDs, bonds, and real estate. There’s a time and place for all of these though, and I would never suggest putting all of your eggs into multiple baskets at once. Start with one basket if you need to or don’t have the time. And start small if you have to. Just don’t put everything in it! With there being a correct ‘time and place’ for everything, I came across an interesting article about the upcoming inflation (or deflation! ), especially with regard to Japan’s recent news (see below). And I think that if you had to choose one or two places to put your money as a starting point right now, I would choose dividend stocks within an index fund, within a Roth IRA. Just keep an eye on the averages. Gold is the next best investment, along with real estate. And for somebody who is first getting started, I think it’s important to start with a solid base (ie – $10,000 or more, if possible) and then to add incrementally onto this over time. If you don’t have that much money, that’s also not a problem!! – and it is certainly NOT an excuse to further procrastinate toward getting started. These are all horrible excuses, and let me tell you why! If you don’t have the time to make yourself $1 million+ dollars over time, you can always pay somebody else to do it for you, but you will be wasting your money when you can easily do it yourself. Whenever people complain about not having enough time, they will also complain that it’s too difficult, or that it takes too much effort to research the stocks, etc. The other excuse related to this is “I don’t have the interest to do it.” In fact, one of my smartest friends insists that paying his financial advisor is much better than doing it himself because he doesn’t have the time and he doesn’t think it’s worth the effort. It’s very sad, but I can tell you that it’s NOT very difficult to do this yourself, and it certainly isn’t rocket science. Most financial advisors will charge 1% on top of the fees being charged for the funds in your account. The advisor also has a lot of other clients and although they may be convincing enough to claim they have your best interest in mind all of the time, they do not. Only you do. And if you can take care of it yourself (again, very easy to do), you will save thousands of dollars a year that can be put back into your investments and compound over time. How much can you save? Let’s assume that your advisor does a terrific job and grows a $500,000 account by 10 percent per year. After ten years, you’ll have paid the advisor $83,000 in fees and your account will be worth $1,172,867. However, if you handled it yourself, without paying the 1 percent, you’d have $1,296,871, over $124,000 more than with the advisor. So it’s not just the $83,000 in fees that you’re paying. That $83,000, when put to work, turns into an extra $41,000. All it takes to get started with investing is $100 extra per month, and you can treat it like another bill. Just $100. Money that is invested or allocated automatically is money you never see in the first place. And it’s important to pay yourself forward FIRST in order to get ahead with growing your money, and I strongly believe in that. This is perhaps one of the best excuses from people who are trying to time the market, or from the people who have a small time horizon to invest, in other words people who are 60+ years old. 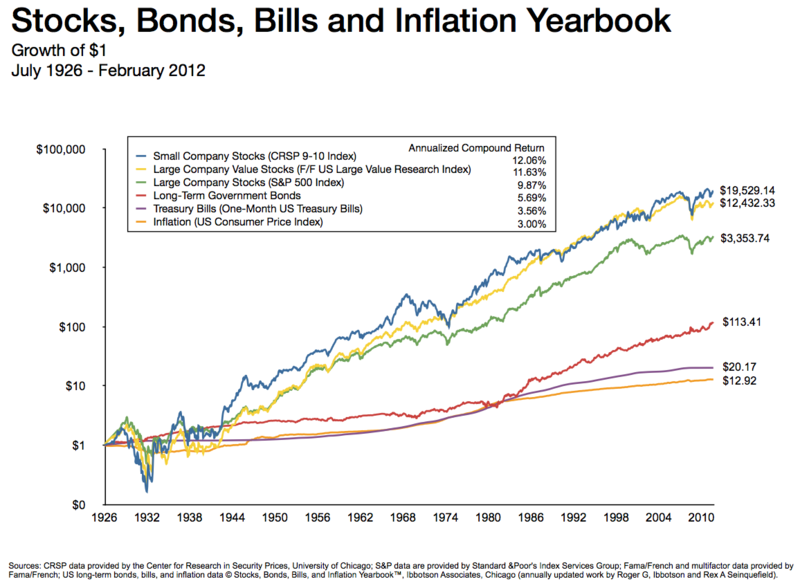 Based on the [Stocks, Bonds, Bills and Inflation Yearbook] chart above, you can see there are periods in history where stocks have dropped and didn’t recover for 7+ consecutive years. So I agree that it’s too risky if your timeline is only 5 years. In fact, I would only suggest investing in stocks if you can keep your money in the market for a minimum of 10 years. Warren Buffet once wrote, “Inactivity strikes us as intelligent behavior”, and there is a reason why he said that. Because it’s really important to be patient! So, if you’re trying to time the market, you are going to fail. But if you’re trying to maximize your savings over the next 10+ years, then it is NEVER a bad time to begin investing, and there are really no excuses. This is also where dollar cost averaging comes into play, buying continually over time to avoid buying at the wrong times. And in this case, it’s important to avoid your own emotions, investing more money when you think the market is at an all-time low, or investing less when you think the market is at an all-time high. I have problems with this. There are exceptions, however, especially during recessions when you are 100% confident that everything is “on sale”! It’s really funny though, because I’ve known people who will insist that investing in the stock market is TOO RISKY, yet they’ll blow hundreds of dollars in a casino in Vegas! You can open up a Roth IRA with an online broker (see my post on online brokers here), and it really isn’t that difficult to do. In fact, if you haven’t already, I would suggest opening a Roth IRA as soon as possible. (There are a few more days to contribute to a 2012 Roth IRA before April 15th, and if you can do it NOW – it’s worth it, because you’ll be able to increase your long-term savings by several thousands of dollars as opposed to waiting another year.) I used to hear great things about Roth IRAs back in college, and there was a lot of information going around about tax advantages, which I didn’t quite understand. Moreover, I didn’t care to know any of the details since I didn’t have many financial responsibilities or a full time job. I always thought a Roth IRA was a place to put your money where you could walk away from it. Opening up a Roth IRA account was a complete mystery. Find out where to put your money! You will need to allocate your money into stocks, mutual funds, index funds, etc. within your Roth IRA account. I would suggest reliable dividend stocks (see my previous blog post below), but if you want to take a very lazy and safe approach – then you could always invest everything into the Permanent Portfolio (PRPFX), which would give you a very nice blend of stocks, bonds, cash and gold for a “fail-safe” portfolio. There are also a number of ETF (exchange traded funds) that could help put you ahead of the game while still being safe and reliable: 7 Funds to Own Forever. A great place to buy gold is within a Roth IRA or another investment account through the fund known as GLD. There are other funds as well, and you can also buy gold directly from a bank if you want. Gold is a very safe vehicle for protection against inflation, and it’s especially successful during recessions. If you really think the economy is recovering, or if you really think that having your money in stocks is the better investment, then gold might not be the best solution, but let’s face it: Nobody, not even the experts, can predict what will happen in the future. Because of this, I think it is always important to have some gold in your portfolio, and it’s even better if you can add this to your portfolio when you first get started! I love dividend stocks – and I can never get enough of them. There is so much proof that reliable dividend stocks come out ahead. The strategy to investing in dividend stocks is simple – buy a bunch of safe stocks (blue chip) that have reliable dividends (15+ years of increasing payout dividends) and hold onto them. I would go with the ‘Dogs of the Dow’ strategy, or even better, you could use the top 10 stocks in the S&P 500 as the ‘Dogs of the S&P 500’ strategy. A quick search on Google will give you plenty of information on this. I’m a huge fan, but I also think it’s important to stay away from unusually high dividends, since this is usually a sign that something is going wrong with the company. If you do buy into some high dividend stocks (NLY, PBI, CLMT for example), and there’s nothing wrong with doing this, just be prepared to keep a close eye on them, and try to find out why their dividend is high and how long it has been high. Don’t just jump to a conclusion after reading 1 article on the internet. EH – FAIL. Never do that. I’ve written about this several times in the past, and I’ll continue to write about this, but never underestimate the power of reinvested dividends. The effect of compound interest is incredible, especially when you continue to do it for 10+ years. Look into DRIPs (dividend reinvestment plans) with your online broker to reinvest the dividends automatically. This type of program is usually free, and it’s very easy to do. Reliable dividend stocks can be in your Roth IRA, or pretty much any investment account you own. Right now is a GREAT time to buy a property, or a second property if you already have one. I’m considering “refinancing” to take advantage of the lower rates myself, and there is a lot of news going around about a housing recovery. I’d like to restructure my loan to get out of my FHA loan and into a conventional 30 year fixed. The problem is that my property is worth less than when I bought it, which means I will need to pay the difference. But, I think it would be silly to NOT take advantage of the lower rates right now. I also think the housing prices will start to rebound very soon. If you can’t buy a property directly, that’s completely understandable. REITs (real estate investment trusts) are great ways to invest in real estate through your Roth IRA, Traditional IRA, or just about any other investment account. I bought a coffee at Dunkin’ Donuts this morning, which has pretty much become my daily routine recently. I always used to feel bad about spending money on coffee and other foods like this, and I always used to be a penny pincher like my parents. Then I did a calculation. In March, I made an average of $4.50 per day in dividends. In February, I made an average of $8.56 per day. In January, I made $11.00 a day in dividends. And that had nothing to do with my stocks going up or down. It all depends on the month, but I think you get the point. This free money is free money. That is, of course, before the 15% capital gain tax, but even with the taxes, it makes me feel a lot better knowing that I’m making enough money to pay for my coffees every day! The great part is that it doesn’t require a whole lot of principal to enjoy the benefits of these dividends. The more money invested, the higher the dividend payback is, but even if there isn’t much principal, I believe everyone can still enjoy dividend gains over time.